Ready for my book club appearance. I put on makeup for the first time in two weeks! I believe I’ve mentioned before my undying love of book clubs. Since my debut historical novel, Keowee Valley, was published waaaayyyy back in 2012, I’ve met with dozens of book clubs to talk about it. These “meetings” never fail to run me through a range of emotions, always ending in grateful joy. Book clubs have been around since books were invented, and they’re all different: formal, informal, strict, or devil-may-care. Some clubs stick to fiction, some nonfiction, some a mix of every genre imaginable. Some book clubs are just for women, some just for men, and some for everyone. Some book clubs start through church, or work, or the local library. Trust me: even if you live in a town with one stoplight, there is a book club (and if not, you can easily start one). For an author, book clubs are especially wonderful places to be introduced. Booky people talk about the books they love with other people. Book clubbers BUY books! Book clubbers love to read! At every book club event to which I’ve ever been invited, I have been fed, welcomed, and feted, in ways big and small. I’ve been given space to talk, and been asked the smartest, most insightful, funny and interesting questions. At every book club I’ve had to really think about many of my answers. Yesterday, I was the guest author at The Cliffs Valley Book Club, in Traveler’s Rest, South Carolina. The Cliffs Valley is a mountain community not too many miles south of the North Carolina border. Fifty women from that community and others had gathered to hear me talk about Keowee Valley, historical fiction and history, writing, my newspaper column, and more. They treated me to a delicious lunch (soup and salad and salmon and cookies, oh my!). They bought all the books I had on hand. (Note to self: bring more books next time.) They made me feel so very welcome. Sometimes, it can be difficult to talk about Keowee Valley. It was my first book, and I have first book love for it. I wrote it in a rush of inspiration, filling it with everything I loved about history and adventure and romance, and the land where I’d grown up: the South Carolina Blue Ridge, and the Western North Carolina mountains. But I finished writing it in 2007, and it was finally published by Bell Bridge Books, an independent press out of Memphis, Tennessee, in September of 2012. That’s nearly 7 years ago. In between the writing of Keowee Valley and now, lots of stuff has happened. Stuff upon stuff. I traveled to Costa Rica and Scotland, taught at three different colleges, had two babies, spent three years in graduate school (and graduated! ), lost one old dog and gained a new puppy, made and lost friends, became a newspaper and magazine columnist, became an aunt, tried and failed to write another research-heavy historical novel, and ever so much more. I used to think my brain could hold infinite amounts of information–I am, after all, a champion of random knowledge (you probably want me on your Trivial Pursuit team). But “mom brain” is real, and I’ve forgotten things. Sometimes, I worry that at book club meetings, the members will know more about Keowee Valley, and remember more, than I do at this point. After all, they’ve just read it: everything is fresh and new. I lived with the story for years, and brought it to fruition, but have had to concentrate on other things. Things like jobs, and children, and new creative work. So I love it when book clubbers (it’s sort of cracking me up to call them this: I’m picturing well-read ladies rocking out to techno in a strobe-lit night club) ask questions which force me to dig deep. Yesterday, in fact, one reader asked me, “What have you learned from your writing?” It took me completely aback, it was such a good–and complicated–question. I went to graduate school for writing. 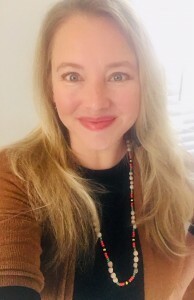 I went at a time in my life which probably wasn’t the best move: I was a college professor with a two year-old at home and was pregnant, and gave birth to my second child, during the program. My brain was mush, but I was desperate for a creative life. I learned so much in that program, about craft in general, it’s impossible to pin it all down. I answered that my writing has taught me to slow down, to sit still with my story. That it’s taught me to consider the reader: not in a marketing sense, but in a real, story-building sense. There was so much more I could’ve said, when answering that question. I thought about it long after, as I drove my car back up and into the higher N.C. mountains and home, rain splashing my windshield, just in time to pick my kids up from school. Readers get me. 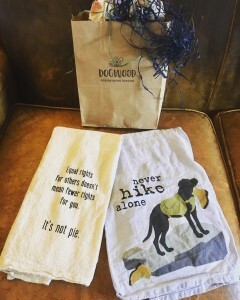 These tea towels came from Dogwood gifts in Flat Rock, N.C.
towels speak my language. Molly had read enough of my writing–my novel and my many newspaper columns–to know exactly what to get me. It was thoughtful and fun. And this is why I love book clubs. I’m ever so thankful my first book love, Keowee Valley, continues to be read and enjoyed. This is, of course, what ever writer dreams about. I promise: I am writing so danged hard on the next novel! This entry was posted in Uncategorized and tagged American history, amwriting, author, author event, Bell Bridge Books, Belle Books, book club, book clubs, Carolinas, Cherokee country, Cherokee history, Cherokee Indians, Cliffs communities, colonial period, columnist, Dogwood gifts, first book, first love, first novel, Flat Rock, founding, freelance writer, graduate school, historical adventure, historical fiction, independent publisher, Katherine Scott Crawford, Keowee Valley, MFA in Writing, motherhood, NC, newspaper column, parenthood, press, professor, Quinn and Jack, research, Revolutionary war, small press, speaking engagement, tea towel, teaching, The Cliffs Valley, Upcountry South Carolina, VCFA, Western North Carolina, WNC, writer, writing life. Bookmark the permalink. I loved Keowee Valley and I love book clubs. Book clubs are a way to discover new authors. I have belonged to several and have been fortunate to learn of authors I had never heard of. Emily Whaley, Dorie Sanders, Effie Wilder, to name a few. PLUS, I loved your newspaper articles. I’m so glad you loved Keowee Valley, Barbara! Thank you for reading it! And I agree: book clubs are a perfect way to be introduced to new authors. It’s always fun learning what kind of stuff your friends like to read: what really touches them.